Hello and welcome to Waterloo Gospel Hall’s website. It is a work in progress and as we continue we will put up relevant content. In the meantime we can give you some basic information while we get ourselves sorted out. If you’re in the vicinity please do come and spend some time with us, we’d love to make you feel welcome. 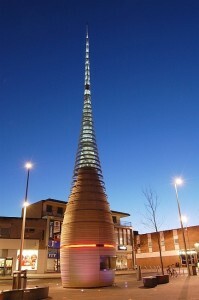 Weston super Mare’s Silica Sculpture – nicknamed “the carrot”.